Sure, Halloween is still a few weeks away, but if you’re planning to put up any outdoor decorations, it’s a good idea to start thinking about your options. Waiting until the last minute to dress up your home might result in just a sad, saggy pumpkin lolling around on your front step, and some terrible facial tissue ghosts bobbing around overhead. In addition to carving vegetables like pumpkins and squashes, which are both delicious and compostable, you can check out some of the great eco-friendly decor options out there to make this Halloween the greenest one yet. There’s a wide variety of Jack o’Lantern items out there, but some of the best and brightest just happen to be solar powered. Not only do these glow with the ethereal awesomeness of clean solar energy, but since they’re reusable, you’ll be able to use them again and again instead of just discarding them on November 1st. Speaking of solar power, nothing says “AHHH!! 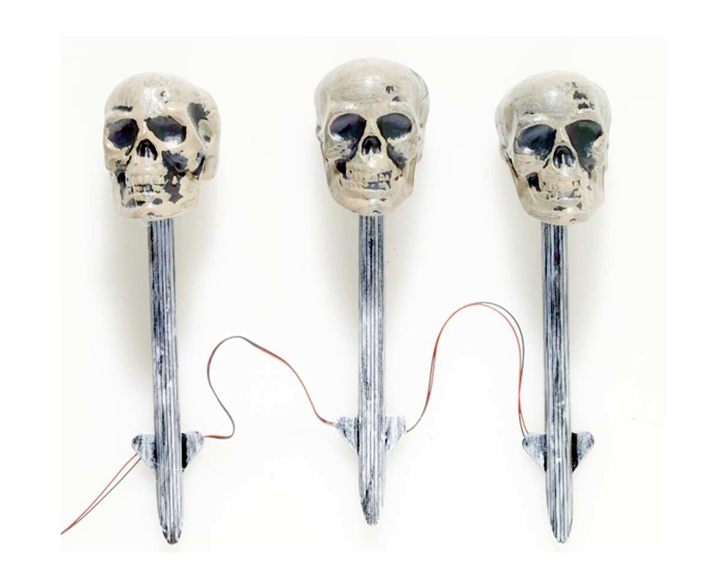 !” quite like these solar-powered skulls on spikes. You’ll be sure to freak out the neighborhood kids if you stick a bunch of these in your lawn. Skulls, skeletons, disembodied heads… they’re all associated with this spook-tacular holiday, but we don’t actually have to harm anything (or anyone!) in order to channel the spirit of the season. Cardboard Safari creates all kinds of decorative items from recycled cardboard, including Halloween wreaths like this one. 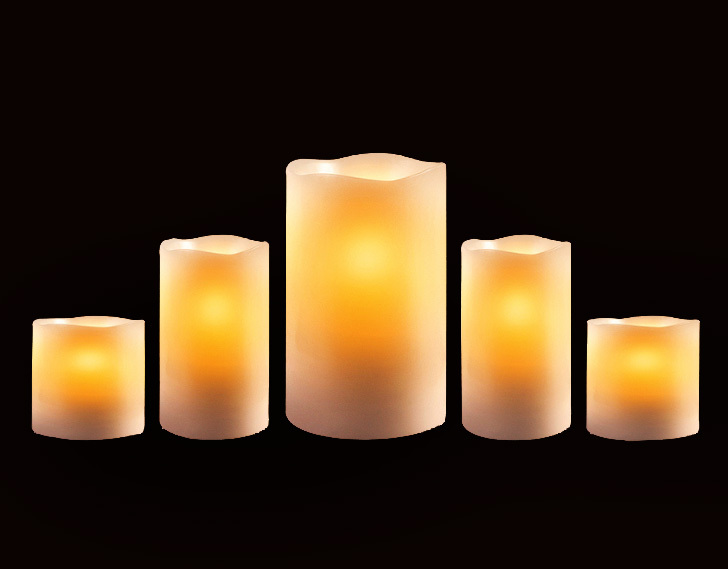 LED candles aren’t really designed specifically for Halloween decor, but we think they’d make great lumieres. They flicker and provide the soft glow of real candles without any of the smoke, short life span, or fire hazards that real candles bring (especially if they’re popped inside carved pumpkins), and would be especially appropriate for lining your patio on a cold autumn night. You know what? Scarecrows are terrifying. Prop one on your porch and you’re sure to have at least a few local kids too scared to knock on your door for candy. You can either buy a pre-made scarecrow prop that you can use again in the future, or pop down to the local thrift store for a few inexpensive prop-making supplies. 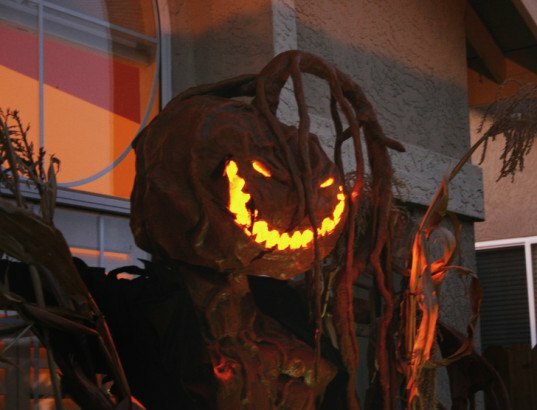 Stuff some used clothes with straw, use a carved pumpkin or a burlap sack for a head, arrange that into an approximate human form, add dead leaves and foliage for effect, and plunk it onto your porch to scare the guts out of your neighbors. Finally, these Firefly Garden lights aren’t really specific to Halloween either, but they are perfect for the fall. 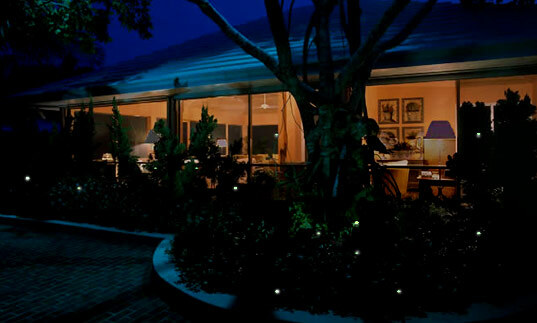 Firefly Magic’s lights are programmed to flicker and fade just like real fireflies, and they even come with solar-powered batteries. If you have any other ideas, please share them with us in the comments section below! Getting costumes at resale shops is what we did. Hey, they’ve been worn maybe once, and the ones we found were of good quality, and often in the original packaging. Since some of the accessories they come with are um,...cheesy, we grabbed some “real” accessories and gave them some flair. BWT, I found lots more good costume ideas from this article by some thrift store chain called value village. http://newsinfusion.com/video_details.php?videoId=235. Well said Frances – perhaps you’d like to share some of your beautiful ideas one day? As an environmental architect living in the UK I regularly browse Inhabitat for inspiration, but COME ON! Let’s have a little more critical thinking please. The implication that these featured products are ‘safer’ than candles and pumpkins is bizarre – do we understand what goes in to making a Ni-Cad battery, and the legacy they leave behind when they are thrown away? True, one candle can cause death and destruction, but with risk comes responsibility and with responsibility very often comes reward. From time-to-time we choose to let our six year old son carry a candle in a candle-holder through our darkened house to the bathroom and enjoy the grin on his face as the shadows leap around him. But we also make sure he understands the need for care and what to do if something goes wrong – and we don’t just leave him to it – one of us takes the time to ‘be around’ just in case something does goes wrong. We live in and are often shaped by a frenetic, risk averse, consumerist climate, but that doesn’t mean we have to unthinkingly accept it or blindly follow it. One of the best thing about Halloween is the fact that the primary decoration [the pumpkin] can be repurposed so easily. Carve it up and illuminate with a candle, roast the seeds with a little salt, cook the pumpkin into soup or whatever. Anything that's left over goes into the compost for next spring's garden. Faking reality. Superficiality. Landfill stuff. Plastics and petroleum. Consider adjusting life so that it has more genuine substance, instead of trying to buy that substance. The first road leads to satisfaction and fulfillment, the latter to shallow pleasures. The joy of candles is the quality of their unstable light, which can't be reproduced. The joy of fireflies is that they are temporal and again, visually "unstable" as they dance high and low in the twilight. True, fundamental beauty and pleasure comes from things that we CAN'T control: sunsets, blossoms, crashing surf, fire and fireflies.....Why do we have to try to own it? It is so much more satisfiying to share an evening with friends with candles that you've made, (which I've done; the pleasure is in the process); so much more simple joy in bringing your friends to a place with real fireflies, (definitely a more memorable experience)....Effort: one gets out of something what one puts into it. And practically speaking, it costs a lot more money to acquire such unnecessary things. Faster, more, more, faster.......what for? Where does it get us? As both a consumer product designer and a naturalist/environmentalist, I am having an increasingly difficult time with American's need to produce more stuff that we just don't need, and with my contribution to this malady. The factories I use are in Europe, where their life doesn't revolve around SHOPPING, and I actually feel a sense of relief, a lack of shopping pressure, when I'm there; life is about family, friends, and great food. Hey - I love manufacturerd beauty: Maserati's Vanquish, Macs, Fortuny; but it always begets more, and it all eventually ends up as trash. But conscience compels me to put my money where my mouth is, so I have closed my business, have stopped designing "things", and have moved on to designing ideas; perhaps, beautiful ideas. Hopefully, those of us who preach to the environmental choir are not doing the opposite back in the nave. Sure, Halloween is still a few weeks away, but if you're planning to put up any outdoor decorations, it's a good idea to start thinking about your options. Waiting until the last minute to dress up your home might result in just a sad, saggy pumpkin lolling around on your front step, and some terrible facial tissue ghosts bobbing around overhead. 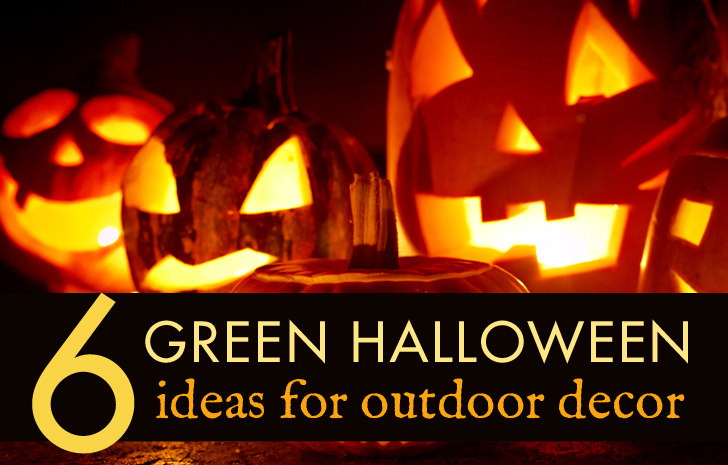 In addition to carving vegetables like pumpkins and squashes, which are both delicious and compostable, you can check out some of the great eco-friendly decor options out there to make this Halloween the greenest one yet. 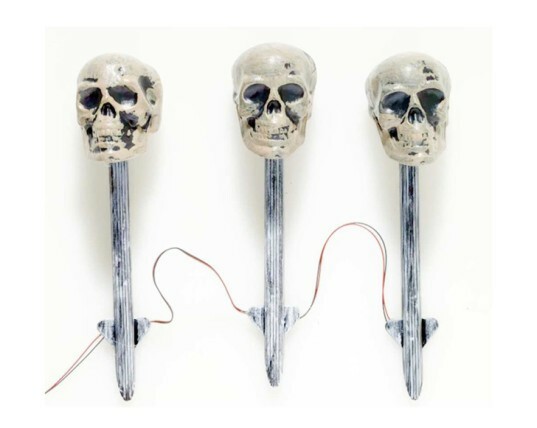 Nothing says "Halloween" quite like solar-powered skulls on spikes sticking out of your lawn. Imagine a kid's reaction to finding this on your porch? Scarecrows are terrifying. 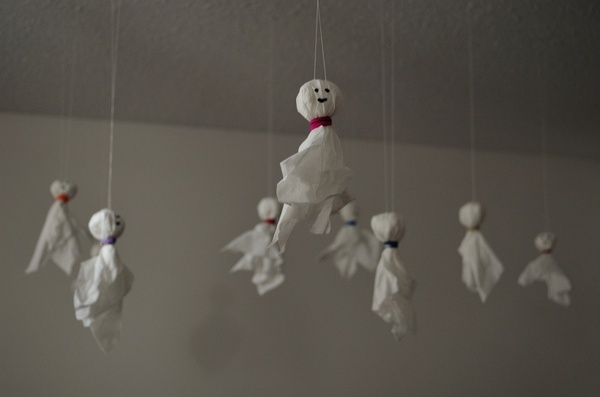 They're also very cheap and easy to make. 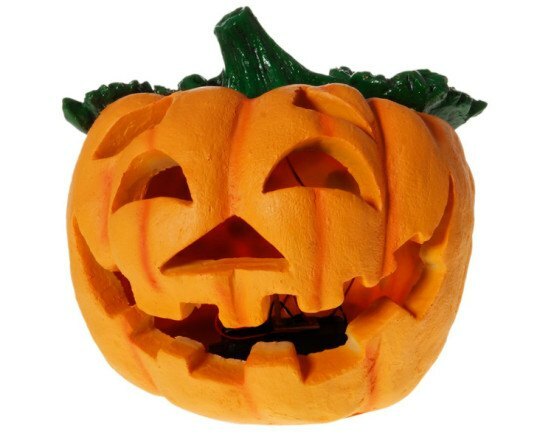 A ceramic pumpkin lit by LED lights can be used again and again for years to come. An assortment of carved pumpkins, gourds, and even things like turnips or eggplants can add a lot of character to your porch. Best of all, you can eat the innards, and compost the shells later. 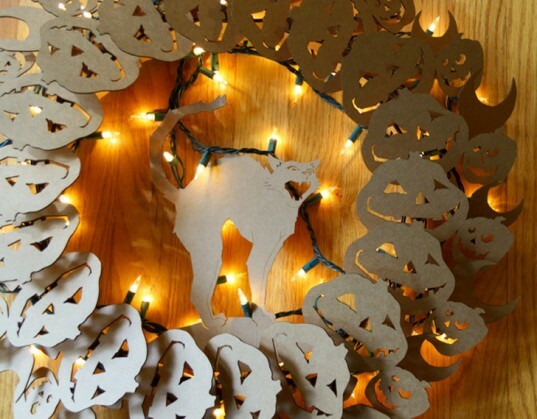 A wreath of cardboard skulls can be lit up with LED lights to brighten up your doorway. LED candles can last for years, and there are no risks associated with burning them like regular candles tucked inside pumpkins or left on porches. Although firefly lights aren't specifically Halloween-themed, they add a touch of spooky magic if paired with other seasonal decor.